from 71,60 EUR* Not ready for shipping. Reserve today and we will ship as soon as possible. Zinc paste bandages are used to support injured limbs. They are composed of zinc oxide, binding material and gauze bandages soaked in water, which can be wound around the injured extremity. This helps support the extremity and set it, and can also be used to treat oedema. Praxisdienst-VET offers zinc paste bandages from various manufacturers. 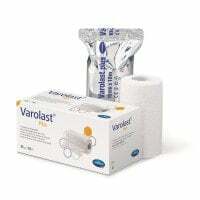 Varolast® Plus from Paul Hartmann is an extra-moist zinc paste bandage that is ready for use; it is very skin-friendly and extremely versatile thanks to its lengthways elasticity. These zinc paste bandages are available from Praxisdienst-VET individually packed in a folding box. 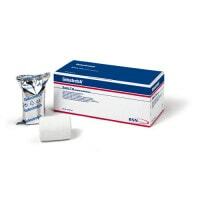 Praxisdienst-VET also supplies zinc paste bandages from BSN medical. The ready for use Gelocast elastic zinc-gel bandage, a semi-rigid permanent bandage, is made from viscose, polyamide and a zinc-gel mass made from hydroxyethyl cellulose. 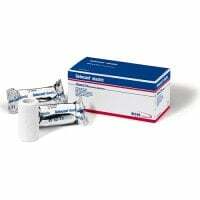 These zinc paste bandages from BSN medical have a low resting pressure with a very high working pressure that encourages circulation in deeper-lying tissues. Gelocast® elastic is available from Praxisdienst-VET packed in loose aluminium protective foil in 10 pc boxes. Purchase the dressings you need, such as zinc paste bandages or cast dressings, easily online at affordable prices - from Praxisdienst-VET!